The high ambition on the part of successive London Mayors since 2008 to create a network of (mostly) segregated cycleways across London has often been controversial and often impeded due to differences arising with individual boroughs. For more detail see London Cycling Campaign’s website. •	Lea Bridge to Dalston – 3km route between Lea Bridge Road and Cycle Superhighway 1 at Dalston. •	Ilford to Barking Riverside – 8km route between the town centres of Ilford and Barking. •	Hackney to the Isle of Dogs – 8km route from Hackney to the Isle of Dogs via Canary Wharf, Mile End and Victoria Park. •	Rotherhithe to Peckham – 4km route to connect with connect other cycling routes such as Quietway 1 and the proposed Cycle Superhighway 4. •	Tottenham Hale to Camden – 8km route covering seven junctions identified as being among the 73 with the worst safety records. first major cycle route, connecting Wembley, Stonebridge Park and Willesden Junction. Works to convert road carriageways to a cycleway do not amount to development requiring planning permission if they fall within section 55(2)(b) of the Town and Country Planning Act 1990: “the carrying out on land within the boundaries of a road by a highway authority of any works required for the maintenance or improvement of the road but, in the case of any such works which are not exclusively for the maintenance of the road, not including any works which may have significant adverse effects on the environment“. In R (The Licensed Taxi Drivers Association) v Transport for London (Patterson J, 10 February 2016) the LTDA sought a declaration that the construction of the East-West Cycle Superhighway without planning permission constituted a breach of planning control. Whether or not planning permission is required, on the facts, for any proposed cycleway, traffic regulation orders are required. Where the road is part of the local highway network rather than a TfL road, TfL needs the agreement of the relevant borough in order to secure all necessary orders. This was what of course recently scuppered TfL’s proposed pedestrianisation of Oxford Street. Westminster City Council has also now successfully challenged TfL’s proposed construction of CS11, designed to run between Swiss Cottage and Portland Place, in R (City of Westminster) v Transport for London (Sir Ross Cranston, 13 September 2018), having taken over proceedings commenced by a group of local residents. Two parts of the route are on roads for which Westminster City Council is the statutory highway authority. Planning permission from the council is also potentially required for works proposed within Regent’s Park. The Council succeeded in its claim that TfL’s decision to proceed with constructing part of the route should have taken into account the legally relevant consideration that TfL might fail to obtain the necessary consents from Westminster City Council in relation to part of the route. TfL’s justification had assumed that the route would be constructed in its entirety and did not consider whether a phased approach would be viable. It’s difficult entirely to blame the Mayor for these delays in rolling out CS routes. The control held by individual boroughs can be difficult to work around – RBKC having been another particularly intransigent authority – which makes delivery of these, by definition, cross-borough schemes slow and difficult. Despite the wider strategic benefits of cycling in terms of health and air quality, the TRO statutory process can often be seen by local people as inadequate to protect their particular interests in relation to, for instance, the effects caused by displaced traffic or the implications for them of roads being closed to motor vehicles – leading to adversarial positions being taken. But whatever the rights or wrongs in relation to CS11 or indeed in relation to the proposed pedestrianisation of Oxford Street, I find it disappointing to see such public disagreements between the Mayor and Westminster City Council. After all, no one wants a London version of the Gallagher brothers. Good planning relies on good baselines. 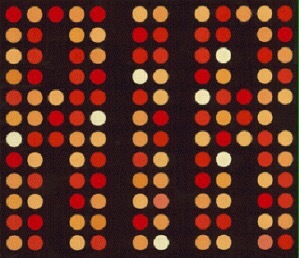 Determining the correct baseline or fallback position is the vital starting point for determining the effects that a development proposal would have, but is not easy – often involving the need for judgment as to what can be done in any event without planning permission or what the position would be in any event in terms of, for instance air quality, highways movements or the effect on the level of daylight and sunlight that existing properties enjoy. In Wiltshire Waste Alliance Limited v Secretary of State (Sir Ross Cranston, 10 May 2018), an inspector had granted permission on appeal for the extension of a waste recycling plant. As well as meaning that the inspector had made a legal error in the way that he had considered the fallback position, the judge accepted that the approach that had been taken “has the potential to infect the conclusions regarding the baseline scenarios” for the purposes of assessment of likely significant environmental effects in the environmental impact assessment. It is a cautionary tale – ensure that you can justify any fallback or baseline position that you rely upon. Whilst it didn’t matter for the purposes of the judgment, I assume that the proposal was assessed under the 2011 EIA Regulations. The 2017 Regulations are more prescriptive. EIA now needs to include a “description of the relevant aspects of the current state of the environment (baseline scenario) and an outline of the likely evolution thereof without implementation of the development as far as natural changes from the baseline scenario can be assessed with reasonable effort on the basis of the availability of environmental information and scientific knowledge“. We have seen recently how assumptions as to air quality levels can be proved wrong in ways that are unexpected, such as the VW emissions scandal that threw into question the degree to which air quality levels would improve as newer vehicles replaced older ones on the road, or ways which are possibly less unexpected, such as the Government’s delayed compliance with the Air Quality Directive. ⁃	Lindblom LJ in Mansell v Tonbridge and Malling Borough Council(Court of Appeal, 8 September 2017): “The question for the court will always be whether, on a fair reading of his report as a whole, the officer has significantly misled the members on a matter bearing upon their decision, and the error goes uncorrected before the decision is made. Minor mistakes may be excused. It is only if the advice is such as to misdirect the members in a serious way—for example, by failing to draw their attention to considerations material to their decision or bringing into account considerations that are immaterial, or misinforming them about relevant facts, or providing them with a false understanding of relevant planning policy—that the court will be able to conclude that their decision was rendered unlawful by the advice they were given. The saga over the UK government’s non-compliance with air quality standards has casualties: a recent study estimated that around 40,000 premature deaths are caused per year due to air pollution. The government has been in breach of the Air Quality Directive since 1 January 2010, by failing to take measures to ensure defined maximum limits of nitrogen dioxide are not exceeded. Limits are currently exceeded in 38 out of 43 zones in the country (each zone representing a conurbation with a population exceeding 250,000). By way of example, acceptable levels are not expected to be realised in London until 2025. The Supreme Court in R (ClientEarth) v Secretary of State (29 April 2015) made a “mandatory order requiring the Secretary of State to prepare new air quality plans under article 23(1), in accordance with a defined timetable, to end with delivery of the revised plans to the Commission not later than 31 December 2015”. The Government purported to comply with the order by way of an announcement on 17 December 2015 the main thrust of which was the introduction of Clean Air Zones in Birmingham, Leeds, Nottingham, Derby and Southampton by 2020, within which zones the most polluting vehicles would be discouraged through charging schemes. – The government “gave disproportionate and unlawful weight to cost and political sensitivity“. The factual background and law are set out in detail in Nathalie Lieven QC’s skeleton argument for ClientEarth. In a bad week for the Government Legal Department, the High Court found for the claimant in a robust judgment by Garnham J handed down on 2 November 2016 (ClientEarth (no 2) v Secretary of State). “i) that the proper construction of Article 23 means that the Secretary of State must aim to achieve compliance by the soonest date possible, that she must choose a route to that objective which reduces exposure as quickly as possible, and that she must take steps which mean meeting the value limits is not just possible, but likely. 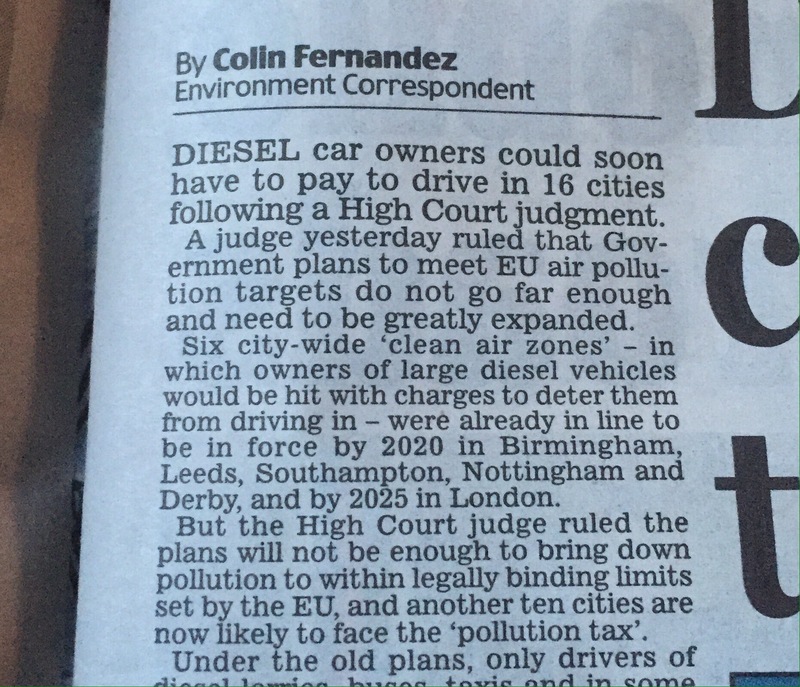 Despite what the Daily Mail may think, the judge did not prescribe specific steps for the government to take, rejecting Nathalie Lieven’s examples of “fiscal measures to disincentivise the use of diesel cars and vans, locally targeted scrappage schemes, targeted vehicle retrofitting schemes and measures specifically targeting diesel cars, which she suggested ought to be adopted so as either to make more certain the achievement of the objectives in the Directive or advance the date of compliance“. How the limits are to be complied with is for the government to decide. For a detailed analysis I recommend David Hart QC’s blog post. The ruling led to a debate in the House of Commons on 3 November 2016. The minister stated: “We accept the judgment of the court and will now carefully consider it, and our next steps, in detail“. Does “accept” mean no appeal? We shall see. What does the ruling mean for planning decisions? The government’s Planning Practice Guidance has a useful section on air quality. – even where limit values are not exceeded in the locality, LPAs must try to prevent developments from worsening air quality and to achieve best air quality. The opinion relies on the CJEU’s ruling in Naturschutz Deutschland v Germany (1 July 2015), a case about water standards under the EU Water Framework Directive. The conclusions reached in the opinion would now need to be tempered by the High Court’s ruling in the Enderby Wharf cruise liner terminal case, PS by his litigation friend TS v Royal Borough of Greenwich (Collins J, 3 August 2016), where a claim that the LPA failed to consider and give effect to the need to ensure that air quality standards were met was unsuccessful – particularly as the opinion specifically refers to the cruise liner proposal by way of example and suggests, not borne out by the case, that the permission would only be lawful with a Grampian condition preventing use of the terminal until air quality could be shown to be acceptable.